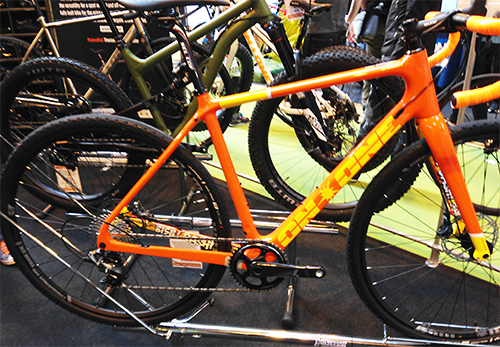 Our third visit to the cycle show in its ‘new’ location at Birmingham’s NEC and it continues to improve. Having Louis and one of his mates in tow meant that we were in pole position when the gates opened and had the pick of the stands. 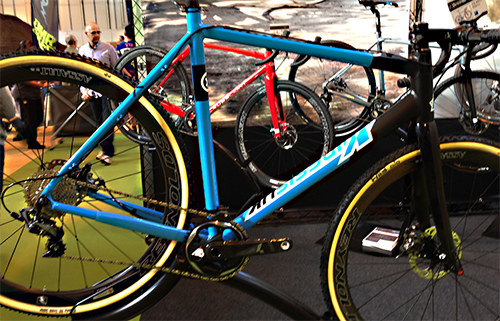 My first stop was a 15 minute chat with Kinesis, where they had their current Pro 6 cyclocross bike beside the new CX Race. I’ve said before that I thought my older Pro 3 was a harsh ride, working at its best during the hour or so of race day and this was backed up by the team there. The CX Race is the natural evolution of the Pro 6 and the design touches that they’ve built into the frame will ensure that it should be on the shopping list of every amateur cyclocross racer – from neatly finished plugs for both canti and disc brakes, discreet Di2 cable routing, no unnecessary mounts for racks and the likes, the whole package has been designed to allow racers on a limited budget to mix and match their options, and importantly migrate from canti to disc brakes as they evolve. We also had a chat about moving to tubular tyres for racing, which was endorsed by their racer and new marketing exec, Bruce Dalton, who felt that tubular tyres could makes ‘minutes’ of difference over a race – definitely food for thought. 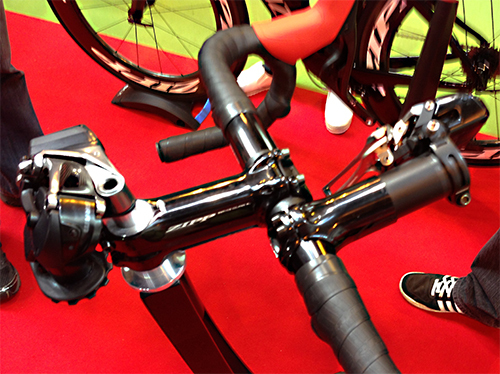 Next stop was SRAM and a close look at their new electronic eTap groupset. They’ve done some lateral thinking here and have developed a system that simplifies the buttons and installation found in the offerings from Shimano and Campag. I’d keep an eye on this SRAM groupset, as it feels as though they’ve made another clever evolution to the way we change gears, and one that will influence the industry over the next year or so. 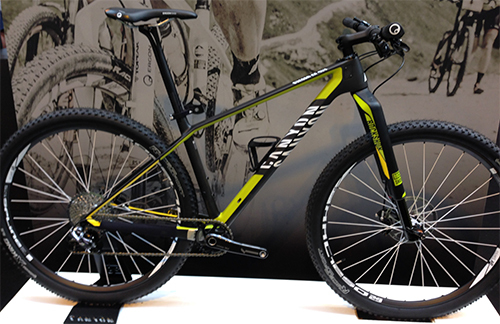 In recent months I’ve been wondering whether a fast hardtail would make more sense for the sort of mountain-biking that I’m doing at the moment, so a chance to take a look at Canyon’s carbon offering was good… and the information and approachability of the staff on the Canyon stand was the best of the day, a view that was endorsed by Louis and his mate (both young teenagers and both well engaged by the Canyon team). 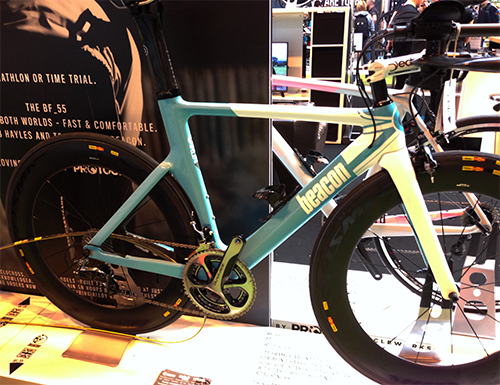 With next year’s triathlon challenge gearing up a decent head of steam, a visit to Beacon bikes was an absolute must. 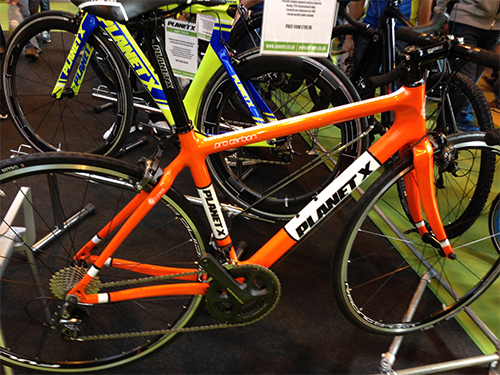 While their BF55 triathlon bike lacks some of the ‘bling’ of offerings from Planet-X and Ribble, it’s clearly a very nice bike. A good chat with Rob ??? 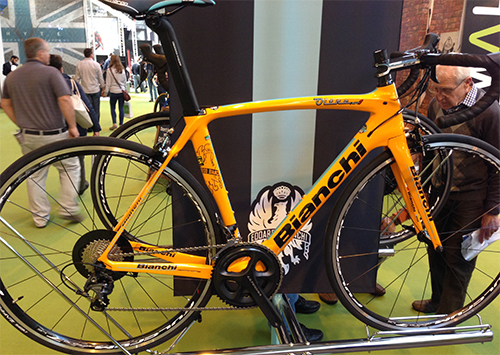 and his experiences of how compliant this bike was proving to be, supported those impressions. 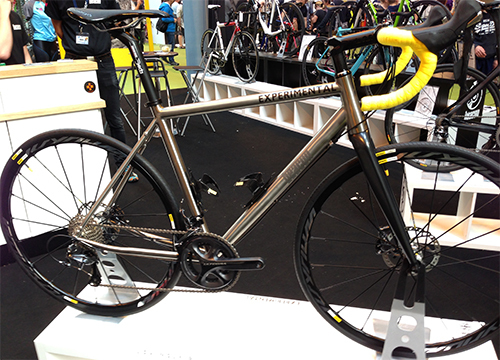 Beacon also had a couple of ‘experimental’ bikes on their stand to gauge customer feedback – I’d be surprised if the carbon and titanium prototypes don’t make it to the production line-ups in the very near future. The only area they’re missing is a fast mountain bike and Rob was keen to pursue a ‘chubby’ offering (like a slimmed down fat bike), although I couldn’t tell how tongue-in-cheek this might have been. Despite the hankering for bikes and bits that’s make the triathlon faster and less painful, at the other extreme there’s a hankering for a fat bike, and there were offerings from a growing number of manufacturers. 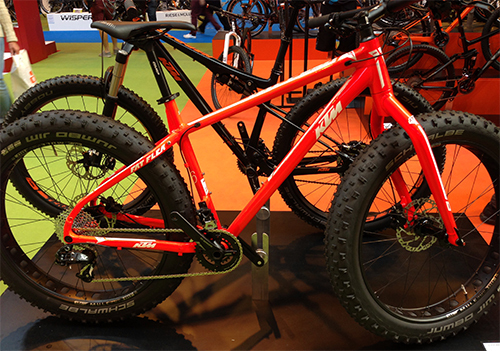 VooDoo have added a fat bike and On-One had new versions from Tomac, but the standout fat bike was the KTM Fat Flea in it’s orange livery. I also had a good chat with the chaps on the Surly store who have convinced me that, despite their obvious bulk, fat bikes aren’t as bad as you’d expect going uphill as “they just roll over everything”. 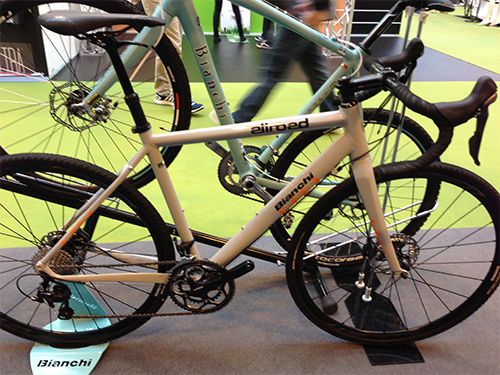 And their newly released Bish Bash Bosh… first impressions in the flesh were very good. They also had their beautiful Eroica, which is a brand new bike that’s been engineered using old-school fittings so that it meets all of the criteria for the L’Eroica events. Being new I can only imagine that the gearshifts and braking are pretty good, even if they don’t quite meet modern Ultegra/Chorus standards, so riding this bike would be like being in a timewarp and picking up a bike from a bike shop 30 years ago… oh, and did I say that it was beautiful, with its steel frame, immaculate lugs and fine paintwork?? 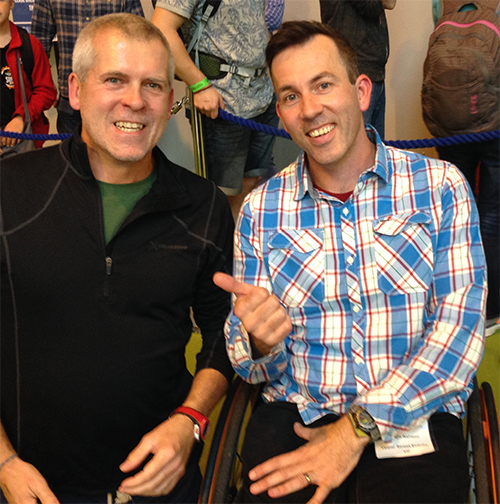 Lastly I got to meet Martyn Ashton and shake his hand. Martyn did a talk that was both humbling and inspiring – he was funny and clearly at terms with the way his life has panned out, and not being defeated by the accident that changed his career. This year was a great cycle show… the kit was exceptional, the people working there were helpful and supportive, and meeting Martyn Ashton made my day. Next PostSRAM eTAP – Gamechanger?